"St. Gregory’s Church and Pre-School in Mansfield will be hosting their Second Annual Fall Festival on Saturday, October 21, 2017 from 9:00 A.M. to 2:00P.M. Last year’s inaugural event was successful and this year's event will be bigger and better. There will be craft and food vendors, bounce houses, games, and pony rides for the family to enjoy." Vendor Spaces will be set up in the parking lot with no electricity. Rental fee for one parking space is $35 or two adjacent spaces for $50. Choice of vendor space is first come first serve. Applications are available here and are due by October 10, 2017. For more information, visit their website or contact their event coordinator at sgpreschool@stgregorysmansfield.org. "Two events, at the same time! Arllington HodgePodge Market, vendor event, some offering hand crafts, boutiques, edibles, jewelry, home decor and more! AND...the LulaRoe Expo...Lots of LulaRoe Reps...all under one roof at the same time...Arlington LulaRoe Expo, Sept. 2. Just in time to snag the latest fall styles! No two LulaRoe Reps carry the same inventory, so come on out, chase unicorns and have fun :)"
Admission is $5 per person. Kids 12 and under are free with paid adult. "Last minute Christmas shopping made easy!!! Jewelry, boutiques, shabby chic, edibles, and more!!! We will also be hosting the Farmers Branch LulaRoe Expo at the same date/time/location!" Admission is $5 per person, kids 12 and under are free with paid adult. 10x10 indoor booth - $125 (one 6 ft table and two chairs are included with this venue). Scentsy & Lipsense are booked. Vendor set up will be Friday from noon to 5 pm, resuming Saturday morning starting at 7 am to 10 am, event is 10 am to 5 pm. "Enchant is a magical experience, full of awe and wonder. Interactive. Fun for families, fun for couples and seniors, fun for groups like Girls Night Out. It will bring out the magic of the holiday season for guests of all ages! The inaugural event originated in 2016 in Vancouver Canada, and attracted over 270,000 attendees; now Enchant is coming to Arlington Texas in 2017, with an expected attendance of 400,000 over 34 days. Activities will include the world’s largest Christmas light maze, ice skating pond, live entertainment, and Christmas Market featuring handmade/hand-crafted products – to showcase & sell your artwork, gifts and specialty items." Admission fee required; Tickets go on sale October 9th. Booths are 10 X 10+ and cost $850+ per week. Discounts available, see application for more information. Booth fee includes custom-made wooden hut, with basic power, overhead light, and lockable doors. Both monthly & weekly rates are available. Prices vary by size, corner booths, and duration. Applications are available here and are due by October 01, 2017. For more information, visit their website or contact their event coordinator Connie at cadams0429@gmail.com / 214-534-5257 or Marsha marshasinger6@gmail.com. "Forney Trade Days Holiday Market - 50+ Crafters & Vendors, Live Music, Inside North Forney High School. FREE to Attend! FREE Parking!" 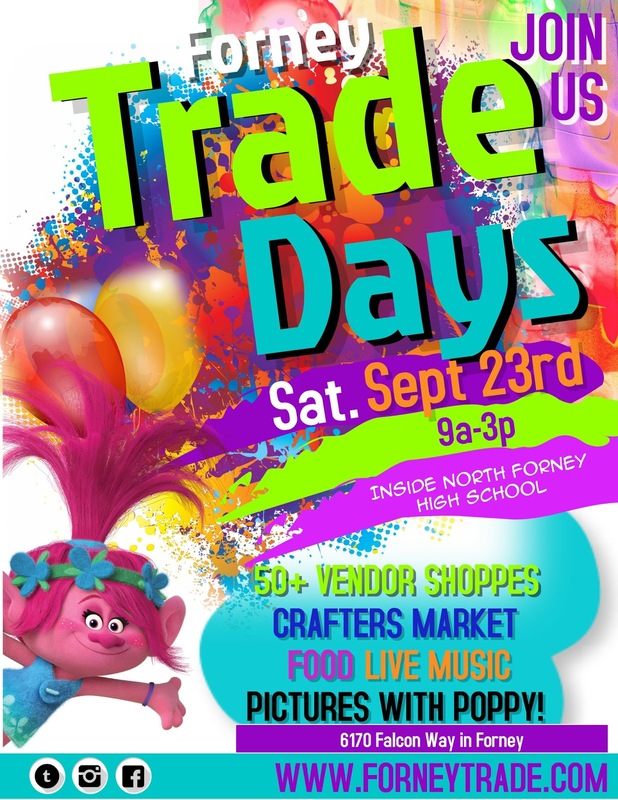 "Forney Trade Days Craft Fair & Vendor Event- Special Guest: Princess Poppy! Bring your camera! 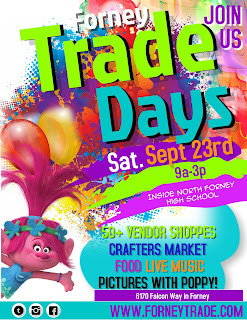 Over 50 vendor shoppes & Great food - foot long corn dogs, snow cones, funnel cakes & more! Live Music. FREE to Attend. FREE Parking." 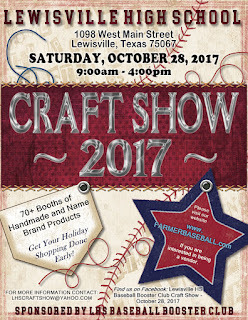 "The 23rd Annual Lewisville High School Baseball Booster Club Craft Show is being held Saturday October 28, 2017. Free Admission. The Lewisville High School cafeteria and halls are filled with arts and crafts, retail, and raffle. Come enjoy the day 9:00 AM - 4:00 PM and start your Holiday shopping with us! Proceeds from this event benefit the Lewisville High School baseball program." This fee includes chairs and limited electricity. Applications are available here and are due by October 1st, 2017 21st, 2017. For more information, visit their website or contact their event coordinator at lhscraftshow@yahoo.com. 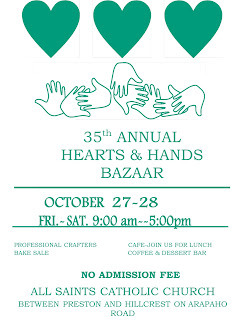 "35th Annual Hearts and Hands Bazaar held at All Saints Catholic Church, 5231 Meadowcreek, Dallas, TX 75248. 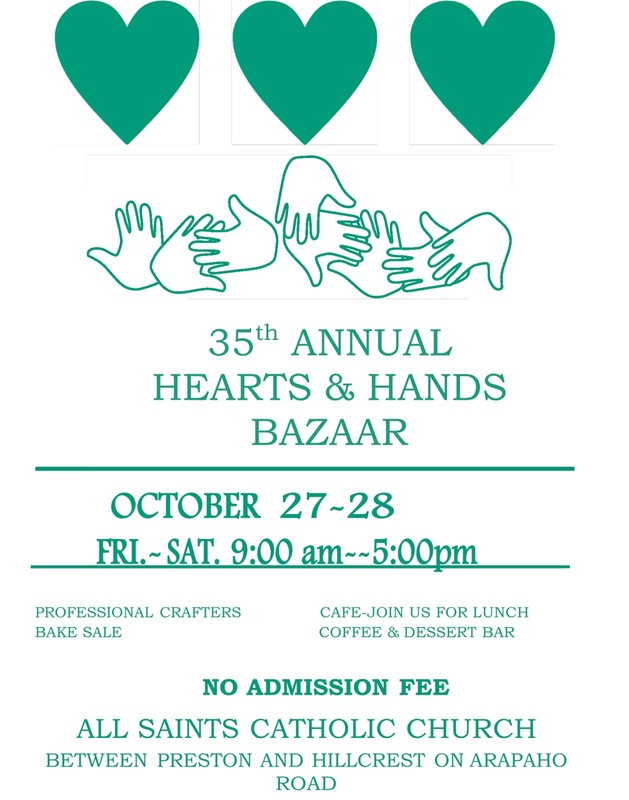 Come join the fun October 27-28 as 60-plus vendors and professional crafters display their goods for shoppers. Scrumptious bake sale, lunch café , and coffee bar also on site. There is no admission fee. Hours of shopping are 9 to 5 both Friday and Saturday." Applications are available here and are due by September 15, 2017. For more information, contact their event coordinator Lynne at mrklynne@sbcglobal.net. "If you’ve heard about the tiny house movement, let me tell you, it’s sweeping the nation and quickly gaining popularity! The Tiny House & Simple Living Jamboree, is the largest and most exciting tiny house and simple living gathering in the world, offering tiny house enthusiasts and curiosity seekers the opportunity to explore this creative way of living. The first Tiny House event in was in 2015. The event attracted more than 50,000 attendees’ in Colorado Springs, Colo. This year, the event will feature a Vendor Fair – a dedicated area of the show where local artisans can display and sell their goods. With an expected attendance of around 60,000, this is an opportunity to showcase your product and art, get exposure on a national scale, and connect with a passionate group of people who appreciate innovation, handiwork, and craftsmanship." For more information, visit their website or contact their event coordinator at Jowyrick@prodigy.net is the vendor coordinator / marshasinger@tinyhousejamboree.com, event coordinator. Free parking. Electric is free and may be requested, but not guaranteed. Chairs are provided, vendors need to provide their own tables. "It's time again for our Annual Arts & Crafts Fair! Our 29th year!! There will be unique gifts and crafts, a Raffle for a hand-made quilt, plus a Silent Auction!" Electricity available on a limited basis; Wi-Fi available. Applications are available here and are due by October 31, 2017. For more information, contact their event coordinator at fpcraftshow@gmail.com. "Bobcat Dazzler Holiday Craft Show!" Applications are available here and are due by October 15, 2017 for Early Registration and November 27, 2017 for Final Registration. For more information, contact their event coordinator at crystalstrausstx@gmail.com / Crystal at 817-913-6600. 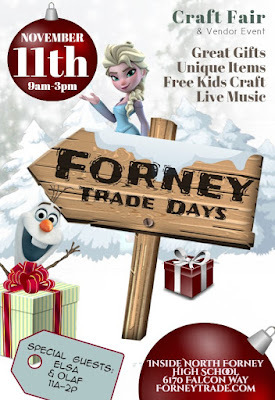 "Fort Worth's #1 destination for one of a kind, handmade, and vintage holiday shopping. Enjoy shopping with the best handmade and vintage sellers North Texas has to offer! Sip on drinks from the bar, hang out in the lounge, snap pics with friends, visit Santa, and finish your holiday shopping in one trip!" Kids 12 and under get in free. $10 parking. These fees include parking pass for one vehicle and admission for one booth helper. Applications are available here and are due by August 25, 2017. For more information, visit their website or contact their event coordinator at cowtownindiebazaar@gmail.com. "The Plano West Senior High School band annual Snowflake Bazaar is one stop shopping for the holidays featuring seasonal items, floral design, gourmet specialties, jewelry, toys, candles, home accessories, ladies and children’s apparel, personalized items, handbags, shoes and so much more! There are over 100 vendors as well as food for purchase, including mini Nothing Bundt cakes. 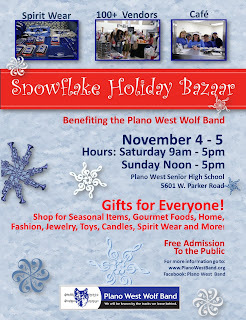 So come by to shop and eat and support the Plano West Band! Sponsored by the Plano West Band Boosters, this is the largest annual fundraiser for the Plano West High School Band. Admission is free." They also rent tables 6′ tables for $15 and electrical outlets for $25. Applications are available here and are due by August 24th, 2017 September 30th for food vendors and craftspeople only. For more information, visit their website or contact their event coordinator at pwshsnowflake@gmail.com. "Two events, at the same time!!! Arlington HodgePodge Market, vendor event, some offering hand crafts, boutiques, edibles, jewelry, home decor and more! AND...the LulaRoe Expo...Lots of LulaRoe Reps...all under one roof at the same time...Arlington LulaRoe Expo, Aug. 19-20. Just in time to snag the latest summer styles!!! No two LulaRoe Reps carry the same inventory, so come on out, chase unicorns and have fun :)"
"Join us October 14 - 9am-4pm for lots of fun and great shopping. Admission is a canned good benefiting Communities In Schools. We will have: All things handmade, painted glassware, Vintage decor, Shabby -Chic furniture, Harvest and Holiday Decorations, BLING, Handbags, Children's clothing, spirit wear, direct sales and more! Shop local - Shop NHS Fall Craft Show!" Booth Fees include 1 chair, helpers to unload, parking, and free wifi. Pre-Order Box lunch- $10.00 (sandwich, Chips, Drink, and Dessert + Delivery to the booth). Applications are available here and are due by October 07, 2017. 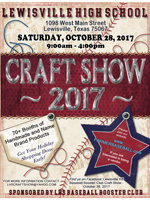 For more information, visit their website, facebook page, or contact their event coordinator at texansbaseballcraftshow@gmail.com. "Last Call For Vendors!! Outdoor 10x10 booth space just $25!! Indoor and outdoor booths filled with handmade items, unique gifts and gadgets...something for everyone in the family!!" Admission is $5 per person. Kids 12 & under are free with paid adult. 10x10 (includes no table/chairs) - $25. This fee includes free parking. Electric, while free, is limited due to few outlets. So electric may be requested, but not guaranteed. Outdoor vendors may bring generators. Event is rain or shine. Overnight security will be provided. "Come get your holiday shopping done early while supporting the Kyle Lewis Memorial and Amoeba Awareness. 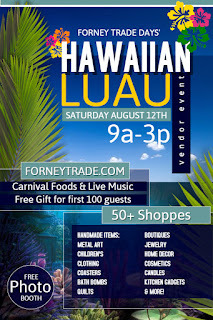 We will have lots of vendors of variety from jewelry to home decor and MORE!" 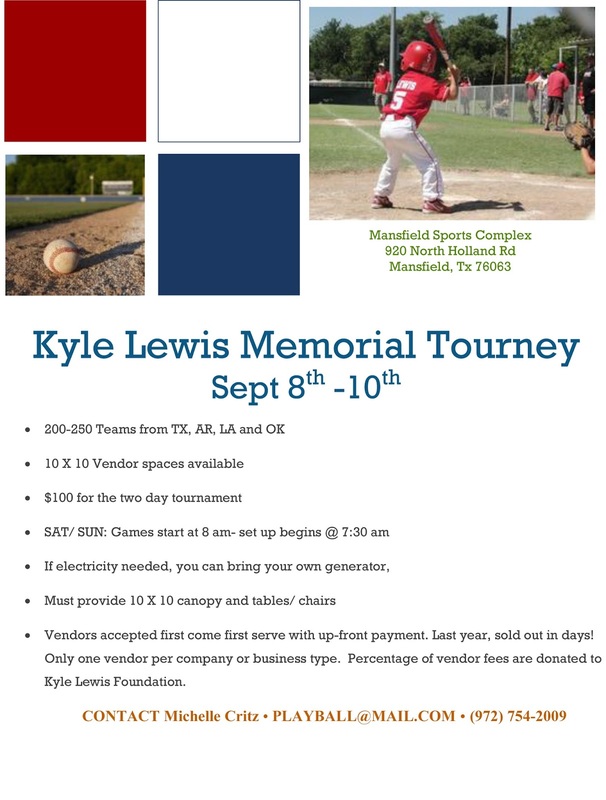 50.00 dollars a day with a % of Booth fee's going to the Kyle Lewis Amoeba Awareness to find a cure. Vendors keep all proceeds. Applications are available here and are due by September 05, 2017. "Great handcrafted items and small businesses, with a focus on Fall, along with lots of LulaRoe Reps...all under one roof at the same time...Waxahachie Fall HodgePodge Market & LulaRoe Expo, Sat, Sept. 30 at the Waxahachie Civic Center. Come chase unicorns!!! Disney will be in the house. Admission is free." One table and two chairs are included with booth fee. "Lots of vendors...HodgePodge Market and LulaRoe Reps...all under one roof at the same time...Fort Worth/Benbrook Fall HodgePodge Market and LulaRoe Expo!" "The second annual Gotta Have It! 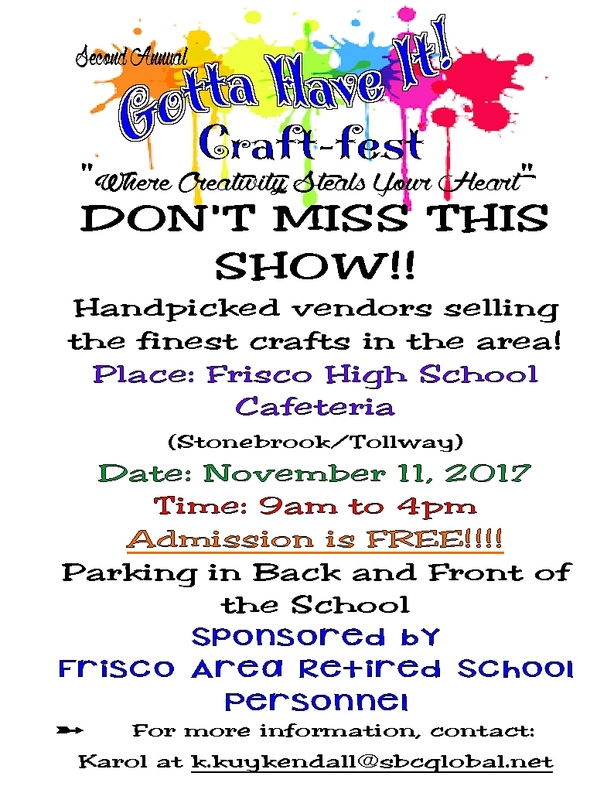 Craft-fest features the finest craftsmen in north Texas! The amazing variety of vendors from pottery to pens will delight you and inspire you! 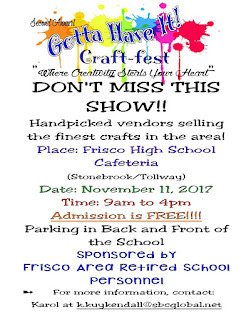 Join us for your Christmas shopping at Frisco High School on November 11th for a fun and crafty day! See you there!" Booths are 10 X 10 and cost $50. Add $10 for electricity. No tables or chairs provided. Vendor hospitality area for drinks and snacks. Applications are available here and are due by October 15, 2017. For more information, visit their website or contact their event coordinator at k.kuykendall@sbcglobal.net / Karol at 214-727-2628. "Great handcrafted items and small businesses, with a focus on Fall, along with lots of LulaRoe Reps...all under one roof at the same time...Murphy Fall HodgePodge Market & LulaRoe Expo, Sat, Oct. 21 at the Murphy Community Center." Admission is $5 per person, kids 12 & under are free with paid adult. Vendors will need to provide their own tables/chairs. 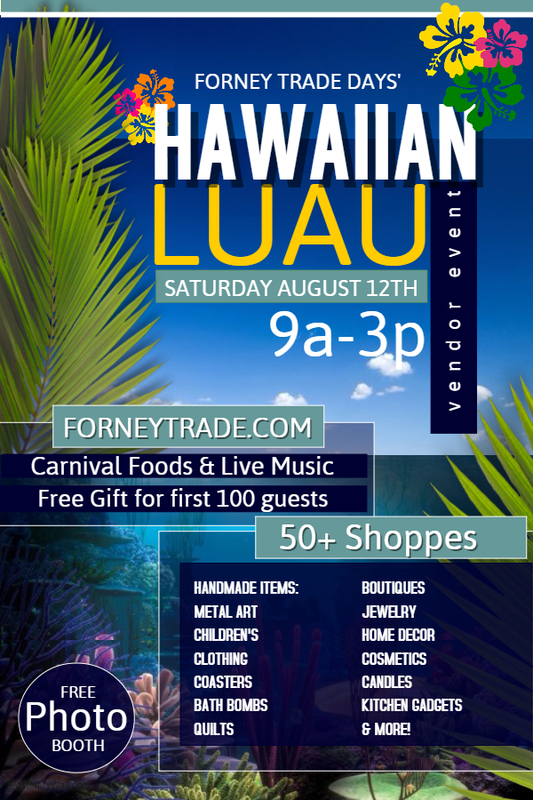 "Featuring hand made items and booths from local consultants and vendors. It is never to early to start your holiday shopping! Free admission!" Booths are 6 X 8 and cost $25. Multiple booths may be purchased if larger space needed. Booths includes a table and access to electricity if needed. For more information, contact their event coordinator at angela@alcgrapevine.com / phone: (817) 329-0454. "Join us as we take over Eddie Deen's Ranch for a Texas sized, boot scootin', kick a$$ Jingle Bash! Etsy Dallas' Jingle Bash, a premier handmade shopping event and party, will showcase the very best in handmade apparel, bags, jewelry, home décor, accessories, art, pottery and more. Hand-picked artists, crafters and designers from near and far gather at the Jingle Bash for one-of-a-kind one-stop shopping. Admission is FREE and kids and strollers are welcome, so come down to Eddie Deen's on Saturday, Nov 11th and join in the fun. Get there early if you want to be one of the first 50 shoppers to get one of our coveted Bash Bags filled with swag from our talented vendors! Two bars on site plus food available to order from Eddie Deens legendary catering company. Make and Take table teaching fun easy to do crafts that you and your kiddos can take home. Photo booth-be on the lookout for our Snapchat geofilters!" Promo packages also available for purchase. Electricity included. Applications are available here and are due by August 18th, 2017. For more information, visit their website or contact their event coordinator at etsydallas@gmail.com / Facebook message: @EtsyDallas. 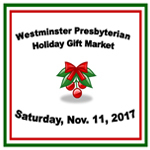 "Westminster Presbyterian Church (WPC) in southwest Fort Worth will host its annual Holiday Gift Market on Saturday, Nov. 11, 2017, from 9 a.m. to 3 p.m. Nearly 50 vendors and crafters from around the Metroplex and beyond will be on hand to help shoppers get a jump start on their holiday lists. The event is FREE for shoppers. Vendor categories include bath & body, clothing & accessories, home décor, food, woodworking, and gifts for children, adults and pets. There will be handmade holiday crafts and foods, plus representatives from companies such as Scentsy, Lu La Rue, Origami Owl, Tupperware and more. In addition, the Holiday Gift Market will offer chances to win raffle items. Shoppers can make a stop at our Cozy Café for a bite to eat. All proceeds will benefit local and international causes such as Presbyterian Night Shelter, Union Gospel Mission, Bread of the World and Haiti Education Fund, among others." Available on first-come, first-served basis. Includes tables and up to two chairs. Applications are available here and are due by October 06, 2017. For more information, visit their website or contact their event coordinator at wpcfwgiftmarket@gmail.com / Susan at 817-907-2594. "Indoor booths, many focusing on fall -- handmade items, refurbished, boutiques/jewelry, yard art, unique gifts and gadgets...something for everyone in the family!!! Great to beat the summer heat and kick off your holiday shopping!!! LulaRoe Expo...no two LulaRoe reps carry the same inventory...great line of comfortable, affordable clothing...sizes 2xs to 3x. Many reps now carry the fabulous Disney line!" Vendors must provide their own tables. Free parking. Electric, while free, is limited due to few outlets. So electric may be requested, but not guaranteed. Outdoor vendors may bring generators. Event is rain or shine. Overnight security will be provided. "Join us on 8th Street in Historic Downtown Midlothian! The Festival is FREE, Join the Wine Walk for only $25 which includes 15 Wine Tasting tickets, Shopping Tote and Wine Glass. This is a great time to gather your family and friends for an evening of live music, food, art, shopping & wine tasting from premier Texas Wineries." Admission Fee: The Festival is FREE to the public. Joining the Wine Walk is $25. Applications are available here and are due by October 20th, 2017. For more information, visit their website or contact their event coordinator at kim@midlothianchamber.org / Kim at 214-514-4755 (call/text). "Fall Festival with games for children, bicycle safety, food, and Craft Show with inside and outside booth space available. Fall and Christmas crafts." Tickets for Games, Photo Booth and Food maybe purchased at door for 25 cents each or 5 for $1. Inside booth may reserve 1 table and 2 chairs. Applications are available here and are due by September 01, 2017. For more information, visit their website or contact their event coordinator at sahealy97@yahoo.com / 1-727-858-8798.